Central High School of McMinn County: Highlights - Battle of the Books! Last year “Battle of the Books” held during football season resulted in over 4,200 books being collected. 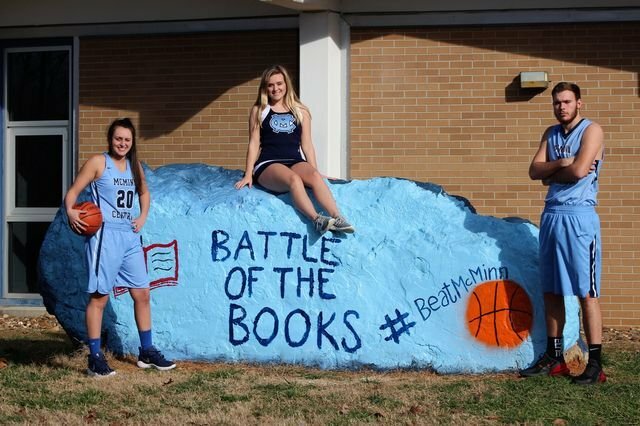 This year the Chargers and Cherokees are teaming up to support early literacy by holding the LR20 Battle of the Books on January 22nd during the McMinn vs. Central basketball game. Fans will cast votes by placing new or gently used children’s books for ages birth to 8 in their school’s collection bin the night of the game. Fans unable to attend the game can cast votes by dropping books off at McMinn or Central High School on or before January 21st. Books will be counted after the first quarter of the boys’ game with the trophy presented at halftime. These books will be shared with children across McMinn County as they will be used to stock the Let’s Read 20 Little Libraries throughout the community as well as the Let’s Read 20 Bus. LR20 is focused on closing the literacy gap by getting books to children throughout McMinn County while encouraging families to read together 20 minutes a day. In support of this initiative, Little Libraries have been placed throughout McMinn County giving children access to books. Additionally, the LR20 bus is stocked with hundreds of books for children to choose from as the bus visits neighborhoods and events throughout the year. Books in the Little Libraries and bus are free for children to take home giving parents, grandparents, and other caregivers the power to make a difference in their child’s life by reading 20 minutes a day with them.